The arsenic urine test checks the arsenic urine level. What is an arsenic urine test? The arsenic urine lab test measures the arsenic urine level. Why is a urine arsenic test important? The arsenic urine test can help identify arsenic toxicity / arsenic poisoning. How do I prepare for an arsenic urine test? Prior to getting a urine arsenic test, it is recommended that one avoids seafood consumption for 48 hours. This Arsenic Urine Test is a urine test. The arsenic urine test, also known as an arsenic urine lab test, measures the arsenic urine level. Arsenic is an element that is found throughout the Earth's crust, volcanic ash, and in many types of minerals. Arsenic is used industrially to make lead alloys and has also been used in various formulations of pesticides. Because of its industrial uses, arsenic poisoning has been reported from occupational exposure. Arsenic can contaminate groundwater and, worldwide, has lead to major incidents of arsenic poisoning in India and Southeast Asia. Arsenic has also been found in groundwater in the United States and Canada. Arsenic toxicity occurs because arsenic disrupts the activities of specific enzymes, and especially processes related to energy production. Excessive arsenic levels in the body can lead to cell death. Various treatments for long-term arsenic poisoning exist although the long-term impact of treatment is unclear. To get an arsenic urine test near you, just order online and get your urine tested at the Quest Diagnostics lab that you selected. Once your arsenic urine lab results are ready, they will be available for download. 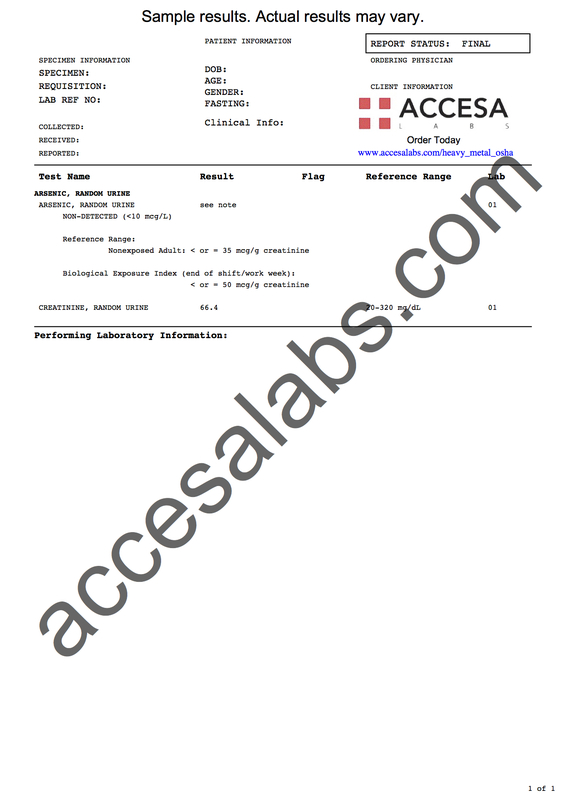 As can be seen on the sample arsenic urine lab report above, the arsenic urine level is reported as not detected if no arsenic is found in the urine by the lab. An arsenic blood test is also available to measure blood arsenic levels. Seafood should not be consumed for 48 hours before testing. This arsenic urine lab test is a component of the heavy metals urine test panel. Arsenic Urine Test at Guaranteed Prices.